Tablets are the new revolutionary technology that brings to you the convenience of sharing, staying connected, being productive and having fun all the time. They are basically smaller ‘mobile’ PCs that come in a variety of sizes starting from a mini 7” handheld device up to 12” of convertible PCs. Tablets have become very popular over the past few years, and they still continue to rise in terms of popularity, functionality, speeds, flexibility and innovation. Not only can tablets be used at home for entertainment (sharing photos, watching videos, streaming music, chatting online via IM or Skype) or for educational purposes (it has been proven to be of great help to students who’re stuck with their homework! ), but these devices have spread into the business environments like fire. 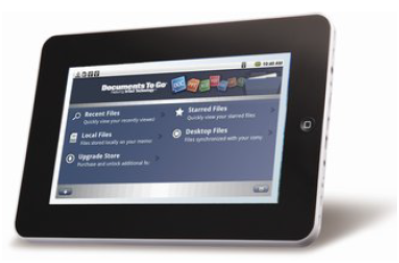 Using a tablet, you can be able to view and edit Office documents, have a browser and email facilities, get access to corporate servers, view e-books, e-magazines, marketing reports and articles, access Software as a Service from providers, have access to Google maps, and subscribe to stock information, news and other required updates. Ain’t it amazing?? More so, with your tablet running on the Android platform, you can install an app called Kloud which will be enable you to access your information and data from virtually anywhere in the world. Kloud basically syncs all your documents, images, music files, e-books etc. with your Net’s devices. You can get more information on this from the website for Net’sGo. So basically, imagine having everything at your fingertips, wherever you are! Communication can never be as easy as this! In fact, you could look at it like being a CEO for yourself: C for Communication; E for Education and O for Operations – be it anything, a tablet really gives you what you ask for. I’m sure now that I’ve rumbled on enough about these tablets; you want to know where you can get one from? No worries – I’ll let you in on that as well! You’ll get the perfect piece of integrated technology from Kaser, who have a variety of options you can choose from. Do have a look and get one for yourself today!